When you have the same flavor from two different local places, you can't help but compare the two right? Case in point is Crescent Ridge Dairy Bar vs Trombetta's Farm. 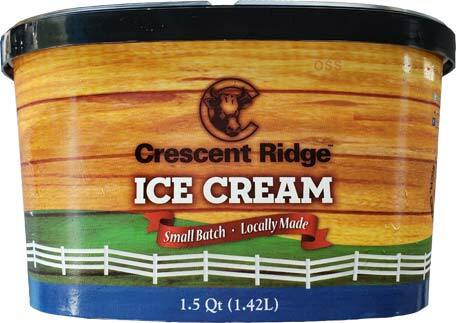 You can drive to both places for a cup or cone of ice cream, but you can also take a freshly scooped quart home from Trombetta's and I can sometimes find Crescent Ridge in my local freezer aisle. "small batch - locally made"
Now I'm going to call this a fight but the truth is that I had Trombetta's first. A coworker brought a quart back for everyone to share but no one else was eating it... so I did! Just look at it, it's wonderful looking right? Ok, the light brown base coloring is kind of lost in the photo, but at least you can see all the cookie dough. 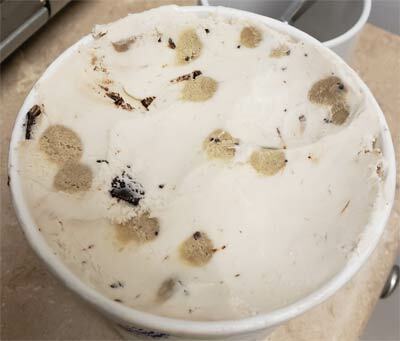 I love love love a flavored base for a cookie dough ice cream. 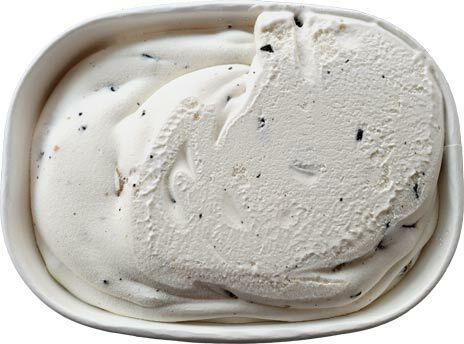 Don't get me wrong, old school cookie dough with a nice vanilla base is classic, but it's a flavored base that brings a cookie dough flavor to life. That's why I used to eat Turkey Hill's version all the time because it had that fun brown sugar and molasses base when no one else did (disclaimer: I don't think it's as good as it once was). Anyway, Trombetta's cookie dough flavor has this great light brown colored base and I fell in love with it more every time I had it. It's top notch stuff here. At some point this summer, I need to get this stuff freshly scooped in to a cone, like say, once a week or so. That's how much I approve of this style of cookie dough. It was a delight to snack on it every day. So I was having a small serving of that every day last week, but now it's all gone. What do I do? Well, I head to Hannaford and try to find some other cookie dough to dive in to. I vaguely remembered that they carried at least one local brand and that brand wound up being Crescent Ridge taking up the bottom shelf of one of the freezers. My choices were limited to vanilla, chocolate, chocolate chip, and moose tracks. I wasn't really in a plain vanilla mood but I'm also still trying to be careful with chocolate, so what do I pick? 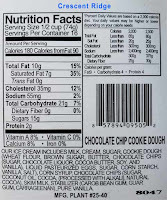 I quickly read the shelf tags and discover a lone container of cookie dough hiding under the vanilla. Success! It's exactly what I want! I hope it's respectable for my $6.89. That's better. They use bigger chocolate chips and there is a decent amount of cookie dough. The texture at the top is a bit gritty (pretty sure from freezerburn), but that's not the biggest issue as the texture does start to slowly improve as I go down. No, the real issue is a lack of flavoring coming from the base. Hopefully this one is better freshly scooped so that there is some kind of sweet cream vibe coming off the base, but as is, it's immensely boring. The cookie dough chunks are respectable texture wise, but they don't pack the ton of flavor needed to elevate the boring base. I ate it, but it doesn't even come close to Trombetta's version. 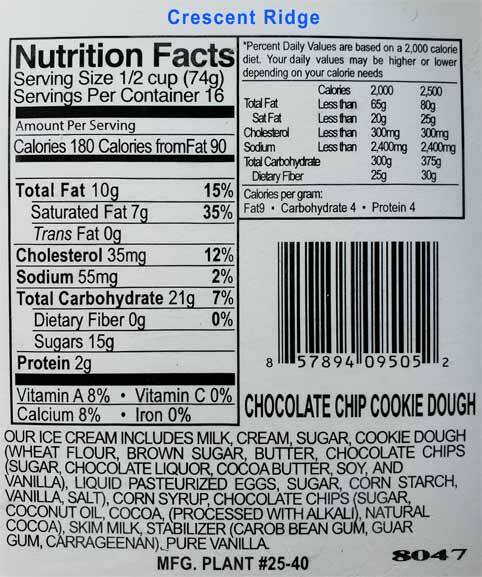 At least it proves my point that a flavored base is the way to make a cookie dough flavor sing. Hopefully my opinion of it will improve over the next several servings, but as is, I don't foresee trying another one of their in store containers. On Second Scoop: just adding a disclaimer here. I'm not saying the Crescent Ridge version is terrible, it's just that it probably suffered some freezer burn which isn't helping with the tame flavoring. I am continuing to work my way through this one. I don't foresee trying CR again unless it's a unique flavor and I'm sure it's fresh. 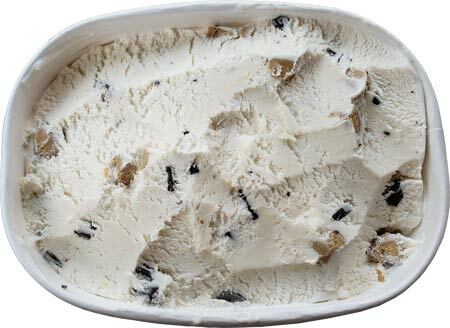 Dubba, I trust your taste buds and since Cookie Dough is my all-time favorite, would you be willing to share your ultimate choice in cookie dough ice cream brands? I would definitely give it a try even if it meant driving to some remote Amish-run gasoline station in the Appalachians. Thanks! In terms of straight store brand options (so nothing mail order or scoop shop), the most flavorful I have tried in the last ten years is probably Wegman's premium cookie dough ice cream. Milk & Cookies will always pop to mind too ofcourse (though it has an extra swirl and such). I assume you've tried the usual suspects like that one and the Haagen-Dazs version. More same flavor brand comparisons please! More often than not I enter the store knowing what flavor ice cream I want and am dumbfounded by which brand to get. Thanks for picking my go to flavor for this one!